This Special Edition A5 SOPMOD is the best choice for those looking for the perfect AR to suppress. A standard 51T AAC flashhider and the A5 adjustable gas valve guarantee trouble-free operation with or without suppressor. This rifle uses the new lightweight sculpted rail derived from the REPR platform. The SPR-MOD rail, at 12” in length, is 33% longer than LWRC Mark II-B rail, but incredibly is still 5% lighter. The cold hammer forged barrel is treated with NiCorr surface conversion process. The weight reduction due to the new rail makes for an incredibly well balanced PISTON rifle. 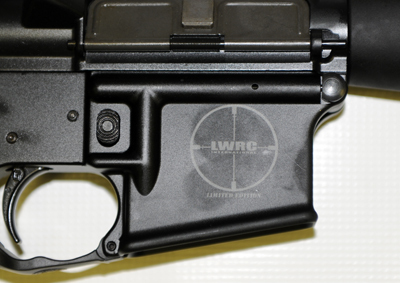 This model has a 16” barrel and a LWRC “Special Edition” logo. 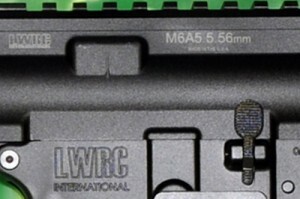 The M6A5 features LWRC enhanced fire control group. The fire control group and the bolt carrier are coated in LWRC proprietary nickel coating that promotes permanent lubricity and allows the operator to run the gun nearly dry when the situation requires it. The piston system is LWRC mid-length system, which provides a more direct recoil impulse for faster follow-up shots. Features: Fluted. PISTON. LWRC Hi Quality Sights. Magpul Package. OUR MOST POPULAR AR! The new LWRC International Special Purpose Rifle (SPR) (the mini-REPR) is the epitome of a well-balanced and fast pointing tactical carbine. The rifle uses a lightweight sculpted rail derived from the REPR platform. The SPR-MOD rail, at 12” in length, is 33% longer than our Mark II-B rail, but incredibly is still 5% lighter. The cold hammer forged barrel is spiral fluted prior to being treated with NiCorr surface conversion process. The spiral fluting shaves 20% of the weight off the barrel and relieves the longitudinal stresses that can cause the stringing seen in conventionally fluted barrels. The weight reduction in the front end and the svelte wrist of the user configurable rail, make for an incredibly well balanced rifle. This model has a 14.7″ barrel with a 1.75″ flash suppressor making it the shortest AR you can legally own without additional paperwork. Features: Quad Rail. High Quality Sights. Match Barrel. PISTON. The M6A2™ rifle is a standard carbine with a 16 inch barrel lengths in 5.56mm NATO. The M6A2™ rifle is ideal for those who utilize optical sights as it employs a low- profile gas block. There is no A-frame front sight to obscure the field of view of the optical device. 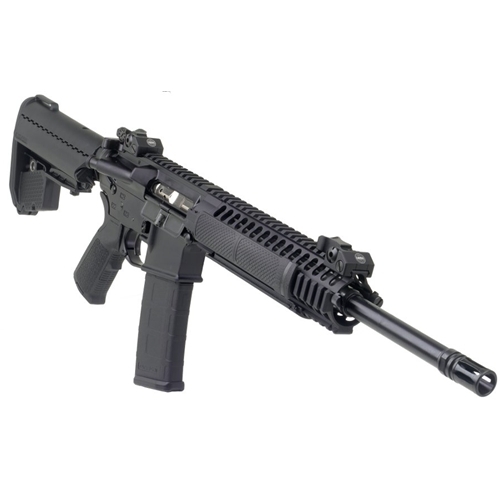 The M6A2™ rifle also features a longer midlength free float rail system with a removable return-to-zero top. Any M4 MIL Std 1913 accessory can be mounted to the rail, and because the rail has a monolithic profile, you can bridge devices from the receiver to the rail seamlessly. The longer rail also affords more 1913 “real estate” to mount your accessories.